Minister of Planting Lots of Trees, Shane Jones, has admitted there has been a stuff up in a planned planting of 1.2 million pine trees in Northland. Only 200,000 seedlings could be planted as most of the land was not sufficiently prepared for the planting. Some seedlings were redistributed, but many were mulched at a cost of $160,000. This is particularly embarrassing because in May this project was promoted as the first of a billion trees to be planted. Northland forestry projects which will create jobs and sustainable developments have been given a helping hand by the Government. Te Uru Rākau (Forestry New Zealand) and the Ngāti Hine Forestry Trust have signed a joint venture agreement to plant and manage around 3,600 hectares of pine trees on the trust’s land. Up to 465 hectares of mānuka will also be planted, which would provide work experience for young people. 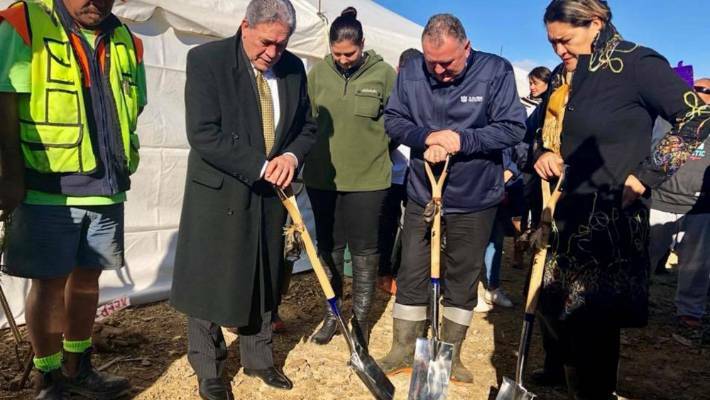 Ministers, including Deputy Prime Minister Winston Peters and Forestry Minister Shane Jones, and MP Willow-Jean Prime planted a pine tree to acknowledge the announcement on May 31, which marked the first joint venture in the Government’s plan to plant one billion trees. Forestry officials working on the Government’s flagship One Billion Trees plan ordered more than one million pine seedlings for a block of land so choked with scrub and weeds planting couldn’t go ahead. Forestry Minister Shane Jones told the New Zealand Herald “ambition” and “enthusiasm” had a part to play in planting delays which struck the $32 million inaugural joint venture on the Far North forestry block. The local iwi have taken responsibility after about 400,000 seedlings bought by the government to plant in Northland went to waste after the land was too wild to plant on. Ngāti Hine has put its hand up with the trust chair, Pita Tipene, saying he’s ultimately responsible. “What the taxpayer and the government can be assured of is that the total number of hectares over the years will be planted as planned. Mr Tipene said it’s not the end of the world because the land will still be there next year and it will be ready to be planted – albeit it later than the government hoped for. Forestry Minister Shane Jones said the cost to the taxpayer was about $160,000. A deal was done between the Crown and the Ngāti Hine Forestry Trust in the Far North earlier this year and 1.2 million seedlings were bought to be planted. Mr Jones said only 200,000 seedlings were successfully planted because the land wasn’t up to scratch. “Well the land is untamed land, it’s wild, and obviously the analysis that was done on the ground was a lot more ambitious in terms of what could be delivered upon,” he said. It looks like they (Jones, the Government and Ngāti Hine Forestry Trust) rushed into this without being properly prepared, or were too optimistic that they could manage this scale of planting so quickly. Jones wanted greater power to push projects past bureaucratic delays, but this suggests he needs more checks on his recklessness with large amounts of taxpayer money.